Tyrone's Tiernan McCann, manager Mickey Harte and Kieran McGeary dejected. ©INPHO/James Crombie. Former All-Ireland football final referee Pat McEnaney reckons the Ulster counties don't have enough players with the 'X' factor to break Dublin's dominance. Tyrone faced the all-conquering Dubs in the recent All-Ireland SFC final, but lacked the quality and composure needed to cause an upset. 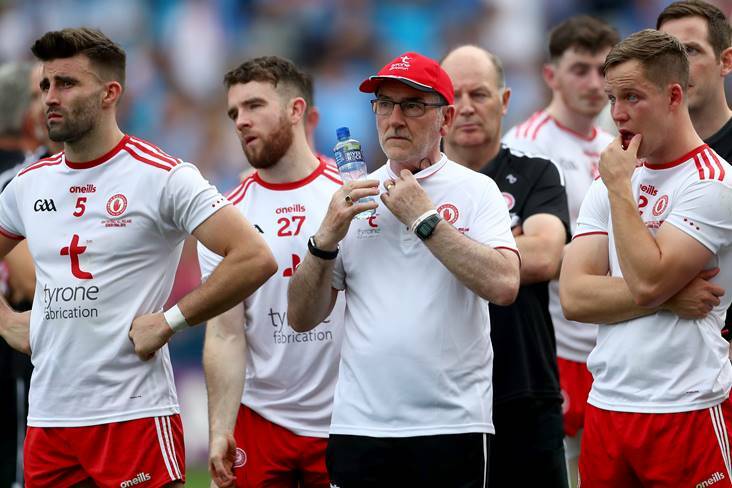 "The present Tyrone set-up has probably the biggest number of good inter-county footballers in its squad but they don't have those special players that you need to deliver on the big days," McEnaney said in an interview with the Belfast Telegraph. "They haven't got a Peter Canavan or a 'Mugsy' in there and neither do Armagh, Down or the other Ulster counties. They don't have those truly gifted two or three players that you really need if you are serious about getting success at the highest level. "Dublin know what it takes to win, they have grown in status and they are aware that every other team is keen to put them down. That makes it harder for those teams with ambitions of trying to achieve that. "Dublin have an awful lot of good footballers. Everyone knows that they have players on their substitutes bench who would walk into most teams. Just take a look at the calibre of some of their players who didn't get to kick a ball in the All-Ireland final."